We may have entered the digital age, but the paperless home or office is still far from becoming reality. 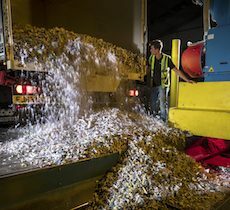 And with the ever-increasing risk of confidential data falling into the wrong hands, demand for our paper shredding continues to grow. Paper shredding confidential documents protects individuals from identity theft and helps businesses and organisations comply with data protection law. Any document containing personal data should be destroyed when no longer needed – even if it’s just a scribbled note of a customer’s address. Our secure and cost-effective mobile and off-site paper shredding services are a quick and easy way to meet your data protection requirements and keep personal data safe from identity thieves. Our mobile shredders can handle 3 tonnes of paper shredding per hour – that’s around 600,000 sheets. Or, if you prefer our off-site service, the industrial shredding machinery at our high-security depots can handle over 10 tonnes or around 2 million sheets an hour. Industrial shredding machines are a world away from the small office shredders you can buy in the shops. 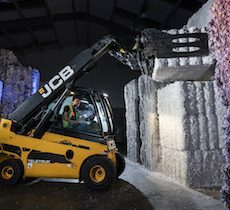 Not only do they shred your documents into random-sized particles, they also mix the fragments up with tonnes of other particles from other sources, so you can be sure your confidential data is irretrievable following destruction. 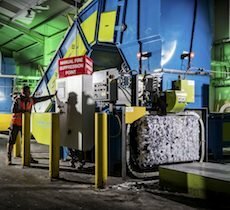 Shredded paper is then automatically compressed into 750kg bales that are distributed to tissue mills across the UK for recycling. Our recycling and the environment page provides more detail on our green initiatives. We are fully accredited to ISO 9001 and 14001 standards, and all staff meet security requirements in accordance with vetting standard BS7858. In 2016 we were licensed by the Gangmasters Authority, confirming our status as a responsible employer, and we are currently the only shredding provider in the UK to hold this accreditation. You can find more accreditations and certificates on our accreditations page. To learn more about our shredding services or request a quotation, please contact us. Easy on-site collection and shredding service. Your confidential data is loaded onto our secure shredding vans for immediate shredding and then taken back to our depot to recycle. Collection of your confidential data on our secure vans. The vans are unloaded at our secure shredding depot where shredding takes place by our state-of-the-art shredding machines. Having a home or office clearout and just need a one-off collection and shredding of confidential documentation? We can help. Need your confidential documentation collecting and shredding on a frequent basis? We offer flexible, tailored services to meet your requirements.